To commemorate the 77th Anniversary of this chapter in American history, the Bainbridge Island Japanese American Community, Bainbridge Island Japanese American Exclusion Memorial Association, Bainbridge Island Museum of Art, National Park Service, Bainbridge Island Historical Museum and Eagle Harbor Book Company will host a series of featured events. 10:00 a.m. – 4:00 p.m. First public display of rare and selected WWII era Japanese American community artifacts, shown in tandem with the Bainbridge Island Japanese pioneer village exhibit Yama and Nagaya. http://bihm.wpengine.com/yama-nagaya/ Free admission, Bainbridge Island Historical Museum, 215 Ericksen Avenue NE. 1:30 – 2:30 p.m. World premiere of the National Park Service film “Bearing the Unbearable” documenting the Bainbridge Island Japanese American WWII story, followed by a speakers’ panel featuring representatives of the Bainbridge Island Japanese American Community, film producers and National Park Service. Bainbridge Island Museum of Art, 550 Madison Avenue East. Free, seating is limited, first come, first served. 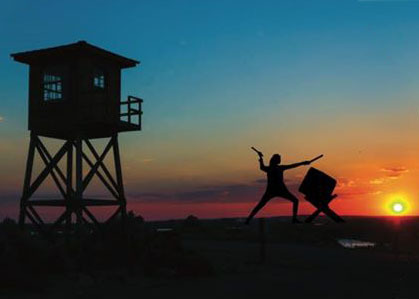 The Bainbridge Island Museum of Art will also be hosting three featured Momentum Festival events in their Frank Buxton Auditorium, all of which directly relate to Japanese American history and issues of social justice. Originally scheduled to be on February 19th - the Day of Remembrance anniversary when President Franklin D. Roosevelt signed Executive Order 9066 on Feb. 19, 1942 - snow and uncertain weather conditions forced the cancellation and rescheduling of “Service and Community” to March 9th, 10 a.m. - 2 p.m. Inspired by the unique legacy of a community that welcomed their Japanese American friends and neighbors home after World War II, on March 9th from 10 AM – 2 PM, volunteers will gather for “Service and Community” at the Bainbridge Island Japanese American Exclusion Memorial, offering landscaping maintenance and improvements to the National Historic Site, located at Pritchard Park, 4192 Eagle Harbor Drive, Bainbridge Island. Hosted by the Bainbridge Island Japanese American Community and generous support from the Bainbridge Island Metropolitan Park and Recreation District, everyone is invited and welcome to pitch in and help. Please wear appropriate clothing for work and weather, bring gloves and your own gardening tools. The Bainbridge Island Japanese American Community (BIJAC) – in partnership with the Bainbridge Island Japanese American Exclusion Memorial Association, the Bainbridge Island Museum of Art (BIMA), the Bainbridge Island Historical Museum and the National Park Service – invites all to experience aseries of free events to honor the first – and all – of 120,000 Japanese Americans to be forcibly exiled from the West Coast during World War II, and to reflect upon the unique legacy of a community that stood by their Japanese American friends and neighbors and welcomed them home. 10 a.m. – 1:00 p.m.: 76TH ANNIVERSARY COMMEMORATION at the Bainbridge Island Japanese American Exclusion Memorial, 4192 Eagle Harbor Drive. Groundbreaking ceremony for the new Exclusion Departure Deck will start promptly at 11 a.m.
National Park Service representatives will be on-site to present and answer questions about their new outdoor interpretive exhibits, recently installed at the memorial site. Parking is extremely limited and carpooling is strongly encouraged. Reserved media parking is available on a space available first-come, first-served basis. 10 a.m. – 4 p.m.: FREE ADMISSION TO THE AWARD-WINNING BAINBRIDGE ISLAND HISTORICAL MUSEUM, including the permanent exhibit “Kodomo No Tame Ni – For the sake of the children” covering the first 100 years of history and legacy of the Bainbridge Island Japanese American community. 215 Ericksen Ave. N.E. 7 p.m.: “THE PINE AND THE CHERRY: JAPANESE AMERICANS IN WASHINGTON” at the Bainbridge Island Museum of Art (BIMA), 550 Winslow Way East, corner of Winslow Way and Highway 305. In partnership with Humanities WA, BIMA, BIJAC and LibraryU, a very special presentation by artist, author and member of one of Seattle's most important families - Mayumi Tsutakawa – who will share “The Pine and the Cherry: Japanese Americans in Washington.” Her presentation tells the story of how our state's Japanese Americans faced the injustice of exclusion and incarceration, and how families who lost everything, including the Tsutakawas, rebuilt their lives and their livelihoods. For more information, please visit the BIMA website at http://www.biartmuseum.org/ Questions may be directed to Kristin Tollefson, BIMA Education Director, at kristin@biartmuseum.org or 206.451.4004. First, we must demand justice for ourselves. Second, those who have privilege and power must intervene for those without. Bainbridge Island will commemorate the 76th anniversary of the signing of President Franklin D. Roosevelt’s Executive Order 9066 with a “Service and Community” volunteer day at the memorial. From 10 a.m. to 2 p.m. February 19, volunteers will gather at the Bainbridge Island Japanese American Exclusion Memorial, offering landscaping maintenance and improvements to the National Historic Site, located at Pritchard Park, 4192 Eagle Harbor Drive, Bainbridge Island. Everyone is welcome to pitch in. Please wear appropriate work clothing, gloves, and bring your own gardening tools. For information, contact Clarence Moriwaki at 206-491-2336 or clarencemoriwaki@gmail.com. Executive Order 9066 was signed on February 19,1942, allowing the incarceration of approximately 120,000 Japanese and Americans of Japanese ancestry living on the West Coast of the United States. Join us in this year's Day of Remembrance, the 76th anniversary of this moment in history to learn, reflect, and support the ongoing efforts of the Minidoka Pilgrimage Planning Committee. “Nidoto Nai Yoni - Let It Not Happen Again” is the timeless and timely message of the Bainbridge Island Japanese American Exclusion Memorial and the theme for the 75th Anniversary Commemoration on March 30, 2017. The Bainbridge Island Japanese American Community (BIJAC) – in partnership with the Bainbridge Island Japanese American Exclusion Memorial Association, the Bainbridge Island Museum of Art (BIMA) and the Bainbridge Island Historical Museum – invites all to experience a day-long series of free events to honor the first – and all – of 120,000 Japanese Americans to be forcibly exiled from the West Coast during World War II, and to reflect upon the unique legacy of a community that stood by their Japanese American friends and neighbors and welcomed them home. 9 a.m. – 4 p.m.: FREE ADMISSION TO THE AWARD-WINNING BAINBRIDGE ISLAND HISTORICAL MUSEUM, including the permanent exhibit “Kodomo No Tame Ni – For the sake of the children” covering the first 100 years of history and legacy of the Bainbridge Island Japanese American community. 215 Ericksen Ave. N.E. 11 a.m. – 12:30 p.m.: 75TH ANNIVERSARY COMMEMORATION CEREMONY at the Bainbridge Island Japanese American Exclusion Memorial, 4192 Eagle Harbor Drive. Ceremony will start promptly at 11 a.m.
Washington Governor Jay Inslee and the Japanese Ambassador to the United States Kenichiro Sasae are among the confirmed speakers at the ceremony. 4 – 6 p.m.: BAINBRIDGE ISLAND JAPANESE AMERICAN COMMUNITY FILMS at the Bainbridge Island Museum of Art, 550 Winslow Way East, corner of Winslow Way and Highway 305. Four award-winning documentary films produced by Bainbridge Island filmmakers will be screened as a series, and each film will be followed by a panel discussion with the filmmakers and participants of the films. See below for full film summaries. Due to limited seating, reservations are strongly recommended. Free tickets for these films are available at Brown Paper Tickets. 7:00 p.m. Join us for a TALK BY BIJAC PRESIDENT CLARENCE MORIWAKI ENTITLED “HISTORY, HONOR, HEALING AND HOPE” on the impact of fear, war hysteria, prejudice and failure of political leadership during the Japanese American exclusion. A brief Q&A with Clarence will follow the talk. Due to limited seating, reservations are strongly recommended. Free tickets for this talk are available at Brown Paper Tickets. Questions may be directed to Kristin Tollefson, BIMA Education Director, at 206.451.4004. Into early April, BIMA will feature art related to the Japanese American experience of WWII and the work of noted Japanese American artists. Join us for a screening of a curated series of short, Bainbridge Islander produced documentary films centered on the subject of the Japanese American exclusion and incarceration. These timeless and timely films promise to resonate with a wide range of audiences. A brief Q&A with filmmakers and participants will follow each film. The first-person story of the struggle of Japanese-American immigrants on Bainbridge Island and the legacy of their culture in the present-day community. From the story of Zenhichi Harui, a Japanese immigrant who came to Bainbridge Island in 1908, to the restoration of the family nursery business by his son, Junkoh, the film traces the obstacles overcome by the Japanese pioneers and their families. Bainbridge Island represented a unique opportunity for the Japanese immigrants, with a multicultural community that tolerated diversity. Even so, from the laws preventing Asians from purchasing land to the exclusion during World War II, the Japanese-Americans had to exert an extraordinary amount of spirit and hard work to prosper. Produced and directed by Lucy Ostrander and Don Sellers of Stourwater Pictures for IslandWood. Exclusion Order No. 1, authorizing the first forced removal and exclusion during WWII, targeted the 276 Japanese Americans living on Bainbridge Island. One of them was 31-year-old Fumiko Hayashida, a pregnant mother of two. 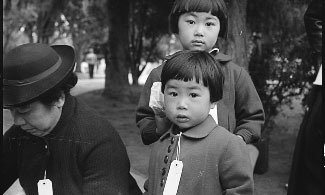 As they waited to be taken off the Island by armed military escorts, Fumiko, holding her 13 month-old daughter Natalie Kayo, was photographed by the Seattle Post-Intelligencer newspaper. This iconic image has become a world-wide symbol of the WWII exclusion and incarceration experience, and the film reveals how that chance photograph became the impetus for Fumiko to publicly lobby against the injustices of the past. Produced and directed by Lucy Ostrander and Don Sellers of Stourwater Pictures for IslandWood. This film focuses on the forced removal and incarceration of Japanese Americans from Bainbridge Island as recounted through the perspective of Dr. Frank Kitamoto, who was a child during World War II. The story is told through interaction between Kitamoto and a small group of high school students from Bainbridge High School as they develop archival photographs from the incarceration and discuss its relevance to post 9/11 America. The film ends with the 2002 dedication of a memorial and plaque marking the site of the Bainbridge Islanders' departure. AFTER SILENCE was produced by the Bainbridge Island Historical Society as part of an exhibition on the community's World War II experience. Created by filmmaker Lois Shelton. The story of the forced removal of Japanese Americans from Bainbridge Island, and the Bainbridge Review publisher/editors Walt and Willy Woodwards' lonely fight against it. Cris Anderson and Bainbridge Islander John de Graaf produced VISIBLE TARGET in 1985 for Seattle public television station KCTS, later broadcast around the nation, making it one of the earliest documentaries to tackle the exclusion and incarceration of Japanese Americans. The film also profiles Walt and Milly Woodward of the Bainbridge Review, among the only West Coast journalists who opposed the treatment of Japanese Americans and features rare interviews with them. On March 30, 1942, about four months after the Japanese attack on Pearl Harbor, then-22-year-old Kay Sakai was removed from her home on Bainbridge Island and taken by ferry to Seattle under armed guard. Lilly Kodama trimmed old fern fronds from a site where 75 years earlier she had boarded a ferry for a trip to a Japanese internment camp. It was an exciting time for a 7-year-old girl. Inspired by the unique legacy of a community that welcomed their Japanese American friends and neighbors home after World War II, on February 19 from 11 AM – 3 PM, volunteers will gather for “Service and Community” at the Bainbridge Island Japanese American Exclusion Memorial, offering landscaping maintenance and improvements to the National Historic Site, located at Pritchard Park, 4192 Eagle Harbor Drive, Bainbridge Island. Work on the memorial site will be done in preparation for the upcoming March 30th commemoration of the first Japanese Americans to be forcibly removed and excluded from the west coast during World War II. Everyone is welcome to pitch in and help, please wear appropriate work clothing, gloves and bring your own gardening tools. Bill Radke talks with writer and Humanities Washington speaker Mayumi Tsutakawa about the 75th anniversary of the World War II order that led to Japanese internment in America. Tsutukawa explains her own personal connection to internment, and how it can help educate about modern prejudices. Japanese-American residents of Bainbridge Island were among the first to be deported to internment camps under President Franklin Roosevelt’s Executive Order 9066. How many internment camps would be needed today?